Washington, DC -- Bryce Harper's three-run homer backed a strong start from Max Scherzer as the Washington Nationals downed the Philadelphia Phillies 7-2 in the second installment of a four-game series. Scherzer (1-1) picked up his first win in a Nationals uniform by throwing eight innings of one-run ball. The offseason acquisition scattered four hits, struck out nine and did not issue a walk. "He's hard to get a hold off," Phillies manager Ryne Sandberg said. "It's hard for guys to zone in and get a handle on him." Danny Espinosa hit a solo homer, and Ryan Zimmerman added a two-run double for Washington, which has won three straight following a slow 2-6 start. Philadelphia's offense struggled again, producing only two runs on a Freddy Galvis groundout in the third inning and a Ryan Howard single in the ninth. The Phillies have scored just 13 runs during a six-game skid. The Nationals jumped on Sean O'Sullivan (0-1) early as Yunel Escobar led off the home first with a single and Ian Desmond was hit by a pitch. Harper fell behind 1-2 before crushing a hanging breaking ball deep to center field for his third home run of the season. 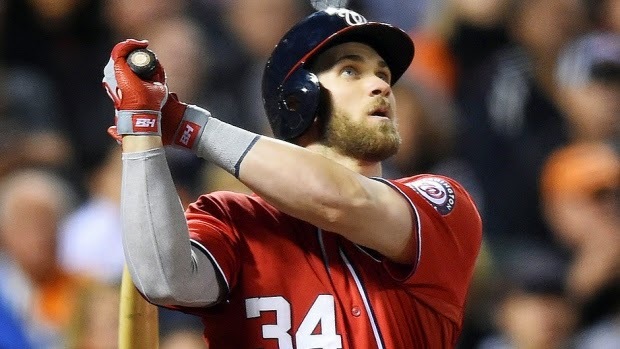 "I was trying to look for a pitch over the plate and not miss," Harper said. "I finally connected with something and put a good swing on it." O'Sullivan caught took much of the plate when facing Espinosa leading off the fourth, and Espinosa hammered the 2-1 sinker that didn't sink to roughly the same spot as Harper's blast. Washington tacked on three more runs against the Phillies' bullpen in the seventh, as Zimmerman hit a two-run double off Jake Diekman and scored on an error by Chase Utley. Scherzer retired 11 of the last 12 hitters he faced. The only baserunner came on a Desmond error in the seventh. Notes: Scherzer has allowed two earned runs over 21 2/3 innings to start the season ... O'Sullivan's line was four runs allowed on five hits and two walks over five innings. He has dropped his last eight decisions ... Phillies starters have a combined record of 1-7 ... Desmond accounted for three of Washington's 10 hits, while Odubel Herrera recorded two of Philadelphia's seven.